As a kiddo I lived in an apartment house with my mom, aunt Judi and cousin Abby. Looking back on those times, endless memories swell upward. I loved the stories aunt Judi would tell about Ethel and Enda (Autumn and Abby in disguise). Judi told stories about when we got houses, had kids and when we bought out Toyota Camry cars. She never told the story: Ethel and Edna run the Marine Corps Marathon. Last Sunday, we lived it. I recently read an article where someone said, “I don’t believe in the 17-mile hitting the wall.” Well, I don’t believe it either. Last year’s Marine Corps Marathon (MCM) had me hit about a million walls. This year’s had me hitting zero walls with less training. When Abby told me she hurt her knee and she wasn’t going to be able to run the MCM, I couldn’t believe it. I was even more surprised, when a few days before the MCM she said she was going to start it and see how far she could go. Something you need to know about Ethel and Edna is that Ethel was ALWAYS taking care of Edna. In true Ethel fashion, I dove into the seedy underbelly of last-minute bib purchasing. I found a true gem in a sweet lady who overbooked her weekend with marathons and was trying to recoup some of the exorbitant fees marathons charge. It was then that I knew, no matter what, WE would finish that race. I don’t know if I’ve only ever thought about writing about what you take with you when you run or if I ACTUALLY did it, but, I would say the most important thing I take with me on each run is the thought of a person. When I focus on that person, the run is more important than me. If I run for them, the run is easy. As Abby sat on the edge of the course, I knew what I had to do. I feel like I said a lot, but the important point was that she deserved a medal and I was going to get it for her. I knew Judi, Chris and Brian were on the way to take care of her, so I started the last ten miles. Every step of the way, Abby was with me. Any pain, fatigue or concern for “beating the bridge” immediately vanished each time the vision of Abby looking up at me from the curb at the side of the MCM materialized in my mind. When I saw Brain and Chris at the start of the bridge and heard Brian scream, “You did it,” I was elated. At that point, I was starting to cramp up in my quads and was thankful for their skillfully supplied Gatorade. Having these two men cheering for me at that pivotal part of the race was life-saving. I couldn’t believe it when 6.2 miles later, Brian and Chris were at the top of the hill leading the runners to the finish. Judi and Abby were 30 feet away from the men and had, with their charm and charisma, talked countless others into cheering for me as well. I found enough something from somewhere deep down to actually kick it in. Only upon meeting up with Abby again in the Runner’s Village was my elation surpassed. Putting that Eagle, Globe and Anchor around her neck was one of the best things I’ve ever done. Abby’s body wouldn’t allow her to physically cross the finish line, but her spirit was with me every last step. 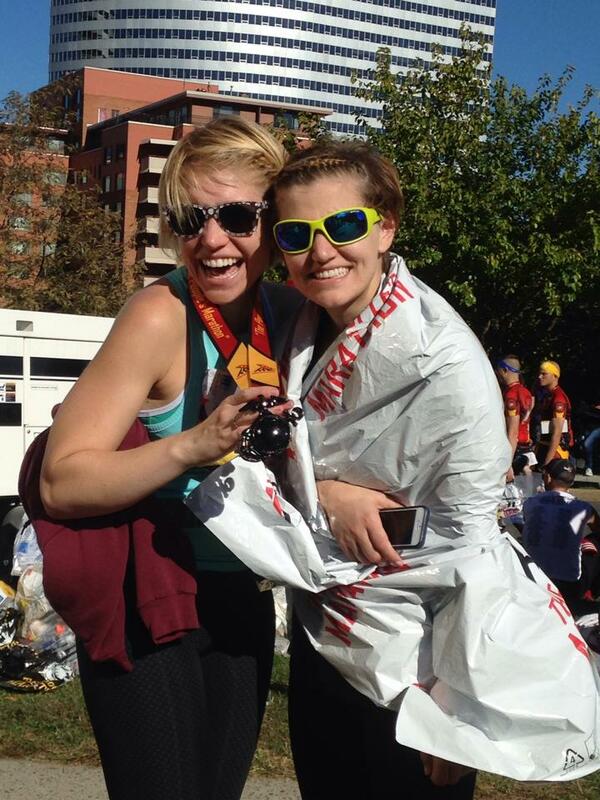 Judi got a pass on this one: Ethel and Edna FINISH the Marine Corps Marathon. Doing the right thing is always the easiest choice.